Properties in Taupo average 4.5 out of 5 stars. Cosy cottage only a short walk to town centre. Property 2: Cosy cottage only a short walk to town centre. Stunning Views, Spa Pool, Entertainers Deck, This spacious home has it ALL! Property 5: Stunning Views, Spa Pool, Entertainers Deck, This spacious home has it ALL! Free WiFi, Cleaning and Linen. Warm and Comfy. Property 20: Free WiFi, Cleaning and Linen. Warm and Comfy. Panoramic Town, Lake and Mountain Views. Property 26: Panoramic Town, Lake and Mountain Views. Superb lake views and gorgeous sunsets make this a wonderful holiday retreat. Everything is here for your stay, short or long. 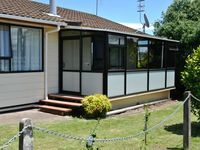 Quick access to shopping in Taupo, as well as highways for trips to Rotorua, Napier, and points further afield. Access road is a bit narrow and the driveway is steep, but you get used to it after a few days. For GREAT local coffee, try Bubu Roasters in shopping center on Acacia Bay Road. Great place. Close to everything. Great place to stay has verything you need. Karen was lovely. Will definitely stay again.